(Beyond Pesticides, January 29, 2019) After eight months of deliberation and discussion, the European Parliament’s Special Committee (the PEST Committee) overwhelmingly approved its draft report in early December 2018 with recommendations to strengthen pesticide restrictions. PEST was established in January 2018 to assess the European Union’s authorization procedure for pesticides. The group’s charge was to review the European Union’s (EU’s) pesticide authorization process, identify its failures in evaluating and approving pesticides and their use (including any conflicts of interest impacting the process), and make recommendations to improve the protection of human, animal, and environmental health from pesticides. The 30-member committee concluded: improvement of the system will require changes in the entirety of the pesticide approval process — from the point of industry application for authorization of a pesticide, to the sale and use of any products containing the compound in EU Member States, to evaluation of impacts of its use once on the market. The approval, sale, use, and regulation of what the EU calls “Plant Protection Products” [PPP] — active substances used to “1) to protect plants or plant products against pests/diseases, 2) to influence the life processes of plants (such as substances influencing their growth, excluding nutrients) and 3) to preserve plant products” — are controlled by the “PPP” Regulation. This regulations uses a two-step approach: active substances (the base chemical compounds) are approved at the EU level, and plant protection products, or formulations, are authorized at the national, or Member State, level. The coalition Citizens for Science in Pesticide Regulation, comprising 120+ groups and institutions, sent an open letter to EU regulators in Member States, calling for reform of the pesticide authorization process and increased levels of protection. The letter charged that the current model of pesticide risk assessment is failing to protect people and the environment from the harm caused by these chemicals, and must be reformed. 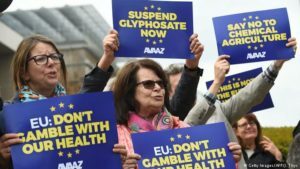 In May of 2017, the European Union proposed a 10-year extension on the approved use of glyphosate-based compounds. Member States of the European Commission (EC) came up short in the EC’s bids to approve 10- and 15-year extensions on the continued use of the compound, and in November issued a limited (five-year) extension for use. The EC was holding out for further information on carcinogenicity, which was assessed by the European Chemicals Agency (ECHA), whose report was issued in March 2017; that assessment found that glyphosate is “unlikely to be carcinogenic.” A chronicle of some of the activity on glyphosate use in Europe can be read here. Relatedly, Beyond Pesticides recently covered the disparity between the conclusions, on glyphosate’s potential carcinogenicity, of the International Agency for Research on Cancer (IARC) and the U.S. Environmental Protection Agency (EPA). Embedded in one recommendation is this retrospective comment: The European Parliament “regrets that the derogation by confirmatory data procedure has led to certain plant protection products that would have otherwise been banned to remain on the market for an extended period of time.” This critique could readily be applied to the poor regulation of glyphosate — and any number of other pesticides — in the U.S. Beyond Pesticides has covered the domestic glyphosate saga for many years; see its most recent Daily News Blog on the matter here. Europe has generally been more proactive, precautionary, and protective of human and environmental health than has the U.S. Regulators, particularly at the Environmental Protection Agency, might take a page from the European Parliament’s efforts; there is certainly overlap in concerns between the EP’s findings and critiques in the U.S. of the pesticide regulatory process. Beyond Pesticides and other advocates for human and environmental health have long pointed to a number of similar failings in this country’s regulatory processes, including transparency issues; “fox and henhouse” concerns (e.g., conflicts of interest in regulating bodies and processes), ecological and non-target harms, failure to evaluate impacts of final pesticide formulations, and inadequate environmental monitoring of pesticide use, not to mention repeated failures to follow the law. In addition, EPA’s general failure to use more-precautionary approaches in its evaluation of pesticides stands in contrast to the PEST Committee’s recommendations. It likewise compares unfavorably with the recent decision of a French court to institute an immediate ban on the use of glyphosate, in which the court said that the French environment agency, ANSES, had not respected the precautionary principle in its consideration of the compound’s potential health risks. Beyond Pesticides reports regularly on domestic and global developments on the understanding, impacts, and regulation of pesticides, herbicides, fungicides, and other chemicals of concern, through its Daily News Blog. This entry was posted on Tuesday, January 29th, 2019 at 12:00 am	and is filed under International, Pesticide Regulation, Uncategorized. You can follow any responses to this entry through the RSS 2.0 feed. You can skip to the end and leave a response. Pinging is currently not allowed.